The LLama name doesn’t immediately demand any attention for the very truthful reason it sounds silly. The product line has had its ups and downs and mostly because of changes in ownership. The average gun owner would be hard to find that even knew there are highly sought after and valuable LLama pistols that rate $4000-5000 price range when and if you can find them. LLama has a bread and butter market of low priced mid to better quality handguns. Due to the market introduction by a less than desirable customer who tends to want to meet at the local Toot-N-Tote gas station to sell you a gun has a gun that exceeds the quality of most new guns in a bottom feeder market. The Minimax is most commonly found in 45 ACP and anyone who has actually shot one will tend to agree they are a great shooting gun. They are well built 1911 that will accept any of the tricks of the trade that make a 1911 shoot at a premium level. Furthermore they are a better than average quality metal. Commander style pistols command a premium as they are made in few quantity and also tend to stay with the owners proximity more often than a full size 1911 so a relationship is formed that is hard to breakup and get the owner to part with on a whim. This is true in all brands. What makes a gun collectable and worth more than the words on a page is desirability and on this gun we did an unusual market test. We put online NO price and would only entertain TRADE OFFERS. 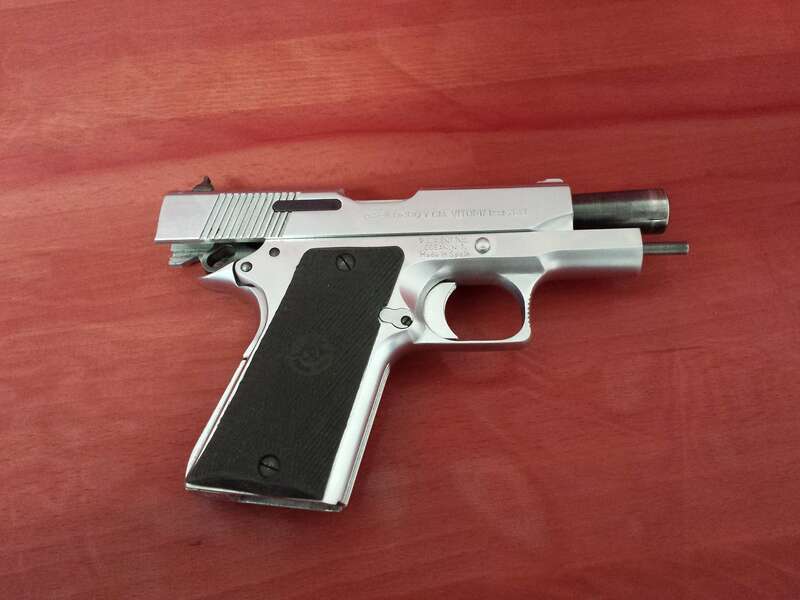 What would you trade to get your hands on a stainless 38 super commander 1911? Our list was long and frankly surprising but gave us insight that we can pass along to you. The 38 super was such a super low production run that its not listed in the bluebook and the Walmart picture book mentions it as a also made in calibers. By our research the production run was for one firearm distributor who order 200 units in 1998. So you can see from varied list of trade offers the market varied from $300 to $1000 in offers I like to ignore the bottom and TOP 10% of the market offers and pricing and we found current market value of this gun to be around $800 in 95% condition (No box one magazine) I would say than a true NIB would be around $1200 putting it at the Kimber / Springfield price mark but its rarely will have the Llama going up in price despite market influence. With the metallurgy being superior to Kimber in my opinion and equal to Springfield Armory with only Ruger emerging on the new production market with the best bang for buck 1911. The fact that this gun was Pre-CNC gun manufacturing really speaks to their lasting quality. They were low cost hand fitted guns without a premium name like Colt to double the price when they were new. There market introduction at a low price does mean the buyer needs to be wary of guns that were not taken care of by their owners or modified by novice/kitchen table gunsmiths. 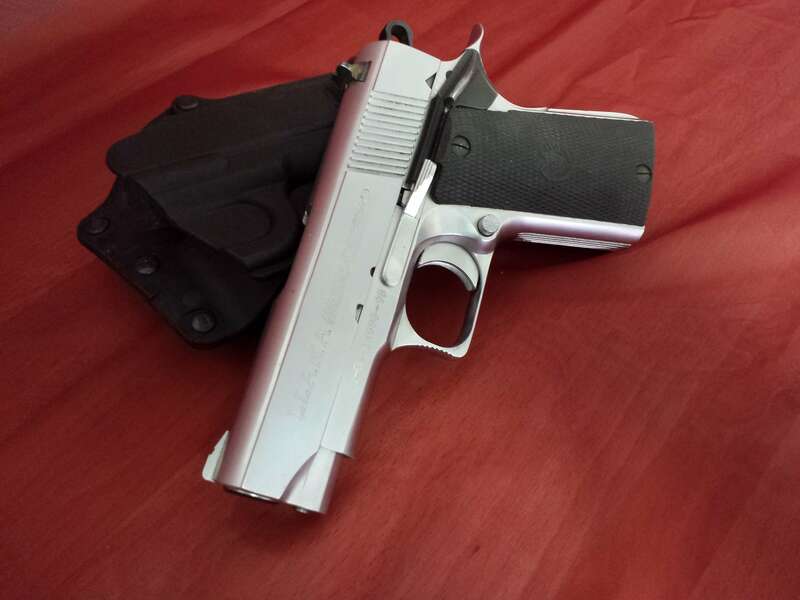 The beauty of the 38 super caliber in a commander size 1911 is its super low recoil and the ammunition being not a common shelved item at Walmart has more to due with its lack of popularity than most influences. The 10mm was its direct replacement and the introduction of the 40 caliber that allowed crossover of magazines between 9mm and 40 calibers really made the market push to push it out of most gun owners thoughts. You will find most 38 supers at the IPSC competitions (due to its power with low recoil) as its still a top competitor caliber that is slowing being replaced by 9mm super which will never be sold to average shoots due to its extreme pressures for a small caliber bullet to compete energy-wise in a Major bullet class. In fact I sold a 38 super colt gold cup UPPER only for over $1000 just a few years ago that I would be inclined to give a full refund of that price back just to get it back. The 38 Super caliber will command premiums in the border states do to some confusion on which guns are legal in Mexico and South America. In Mexico the law restricts any caliber that is listed as a military caliber and the 38 super is not so its assumed that the caliber is legal in Mexico because of the vagueness of the laws. The most important gun laws are contained in the Federal Law of Firearms and Explosives. It establishes a Federal Arms Registry controlled by the Ministry of National Defense. Both the federal and state governments are required to conduct public information campaigns to discourage all forms of weapons ownership and carrying. Only sports-related advertising of firearms is permitted. Title Two of the Federal Law of Firearms allows possession and carrying of handguns in a calibers of .380 or less, although some calibers are excluded, most notably .357 magnum and 9mm parabellum. Members of agricultural collectives and other rural workers are allowed to carry the aforesaid handguns, .22 rifles, and shotguns, as long as they stay outside of urban areas, and obtain a license. Hunters and target shooters may obtain licenses for the above types of firearms, as well as higher-powered rifles. There are a variety of exceptions for particular guns, detailed in the Library of Congress volume cited at the end of this entry. Gun collecting is allowed, with a license and registration. Possession of firearms for home defense is legally permitted. All guns must be registered with the Ministry of National Defense within 30 days of acquisition. Licensees may only buy ammunition for the caliber of gun for which they are licensed. What that says that even though a 9mm is a 380 as is the 38super THEY ARE NOT LEGAL. Its also a law that says local law enforcement should take heed to discourage your possession of a firearm. Although its true that recent transplants of “Undocumented Democrats” as a population does have an affinity for the caliber especially South American cultures where the cartridge is legal.